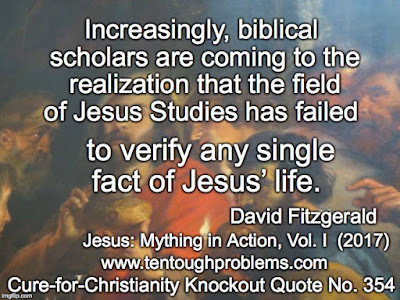 As much as Christians celebrate the virtue of faith, they rely far more on doubt—as in benefit-of-the-doubt—when they want us to believe that the gospel accounts of Jesus are true. Only just so much can be downgraded to metaphor (“Well, of course, you can’t take that literally…”), so their default position is that we need to be overly generous as we scrutinize the gospel stories; give the gospel writers the benefit of the doubt that they were sincere and somehow got it right. But sorry, it doesn’t work that way. Writing history is a rigorous business, as most anyone can see by considering a thought experiment I sometimes suggest. Suppose that someone, in 1915, fifty years after Abraham Lincoln’s death, wanted to write an account of his life, but had no access whatever to documents relating to him, e.g., letters, diaries, newspaper accounts, White House archives, photos, etc. Instead, the person had “heard stories” to use in constructing the account—and also happened to believe that Lincoln was divine and thus ‘information’ about his life can be found by rummaging through Bible texts. No one would take that seriously. But this was ‘writing history’ according to Mark’s playbook. As would be the case with anything written by the Lincoln enthusiast, we discover that Mark’s bias—especially his theological bias—is primarily what we see. The gospel writers, all of them, were propagandists for Christ, as their faith imagined him. And this is one of the standout take-ways when we read Mark, Chapter 4. This is another in my series of articles on the Gospel of Mark, one on each of its 16 chapters. The Introductory article can be found here, then Chapter 1, Chapter 2, and Chapter 3. Always bear in mind that, despite endless conjecture by pious scholars—trying to find something, anything, to hang their hats on—we have no concrete data as to who ‘Mark’ was, where he wrote, or when. For those who want to believe that Mark is history, the fatal defect for this hope is that we do not know his sources. The folks in the big crowd probably knew what sowers did, and they might have thought, “Gee, what a sloppy guy. Be more careful where you throw the seed! So, what’s your point Jesus?” We’re told in earlier chapters that many people flocked to see Jesus because he healed a lot of people—they wanted to just touch his garments—and he cast out demons. We hear in Mark 1:27 that they raved about his new teaching. Did I read that right? This is even a quote from Isaiah 6:9-10, presumably to give it more clout. Jesus confides to his inside circle that he doesn’t want outsiders to perceive, understand his message and repent. He seems to be referring to the common rabble, those great throngs of people who came out to hear him preach. But this doesn’t make sense. Jesus doesn’t want them to repent? This is such a contrast to what we read elsewhere. In Mark 1:38, Jesus says, “Let us go on to the neighboring towns, so that I may proclaim the message there also; for that is what I came out to do.” And in 2:17 Jesus declares, “Those who are well have no need of a physician, but those who are sick; I have come to call not the righteous but sinners.” Why would he then tell those closest to him that he uses parables to keep people in the dark? Yes, of course, Mark got it wrong, and seems to have overlooked his blunder. Or maybe not. He might have known exactly what he was doing, and didn’t care all that much about consistency. There is a possible scenario that makes (some) sense of Mark’s puzzling Jesus script. "The sower sows the word. These are the ones on the path where the word is sown: when they hear, Satan immediately comes and takes away the word that is sown in them. And these are the ones sown on rocky ground: when they hear the word, they immediately receive it with joy. But they have no root, and endure only for a while; then, when trouble or persecution arises on account of the word, immediately they fall away. And others are those sown among the thorns: these are the ones who hear the word, but the cares of the world, and the lure of wealth, and the desire for other things come in and choke the word, and it yields nothing." I’d hate to think how many sermons have been preached just on the words I have bolded: “Don’t let cares, money, and desire for things of this world keep your eye off the heavenly prize.” Sounds good on a Sunday morning—especially the preacher talk about ‘the lure of wealth’—but then ordinary folks get back to their daily routines of handling cares at home and on the job, earning money and desiring the things that make life worth living. This text probably inspired the old Sunday school lyric, “This Little Light of Mine, I’m Gonna Let It Shine.” This meant—so we were told when I was growing up—that we were the light, to help let the world know about Jesus Christ. But the folks who heard these words for the first time probably took most satisfaction from the final words, “…there is nothing hidden, except to be disclosed; nor is anything secret, except to come to light.” This was their reward for remaining loyal to the cult. They were among the precious few to enjoy the secrets of the Kingdom of God. I’ll leave it to the zealous apologists to make Jesus look good on this one. Mark’s script, trying to keep the Jesus cult intact, sets the tone for countless cult leaders to come: folks were expected to give full commitment to the cult, and they will lose everything if they didn’t. Mark continues his theme of the seed being the Kingdom of God. In vv. 26-29 he uses the imagery of seed sprouting and growing, resulting in a good harvest, and in vv. 30-32 the Kingdom of God is compared to a mustard seed that will grow into an enormous bush. He seems to want to assure his followers that their hope for the Kingdom would have a big payoff. Apologists can also deal with the challenge of squaring “he did not speak to them except in parables” with John’s gospel, in which Jesus doesn’t tell any parables at all. Up til now we have read about Jesus healing and casting out demons, but this can be classified as a higher order of miracle: Even the weather obeys him. Mark told us, in the very first verse of his gospel, that Jesus is the Son of God, so bigger miracles are no surprise. But this is yet another example of magical thinking: a holy man, by voice command, turns a raging storm into a dead calm. Thoughtful readers, serious critical thinkers, know that probabilities count far more than possibilities (and apologists are specialists at saying, “Well, you know it’s possible that…”) Which is more likely? (1) That Mark, driven by theology, included this tale to enhance his hero? [It’s no surprise he could awe his readers who had no understanding of causation.] OR, (2) that Jesus really did stop a storm by yelling at it? Chapter 4 is a disappointment to those who want to find out what actually happened in the Jesus story; the author’s agenda is too heavy handed, topped off with fantasy. 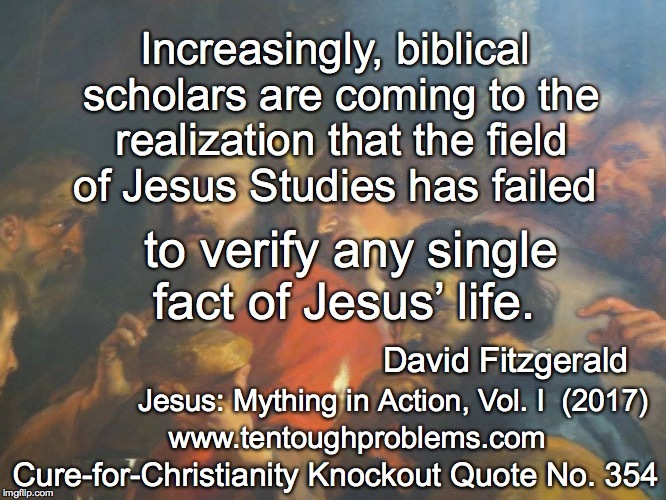 Whether or not you agree with David Fitzgerald’s view that Jesus never existed, he is certainly correct in this assessment: “Increasingly, biblical scholars are coming to the realization that the field of Jesus Studies has failed to verify any single fact of Jesus’ life.” Let’s just hope that no one succeeds in proving that Jesus didn’t want sinners to repent and be forgiven. That would be a setback for the What-Would-Jesus-Do crowd. David Madison was a pastor in the Methodist Church for nine years, and has a PhD in Biblical Studies from Boston University. His book, Ten Tough Problems in Christian Thought and Belief: a Minister-Turned-Atheist Shows Why You Should Ditch the Faith was published in 2016 by Tellectual Press.